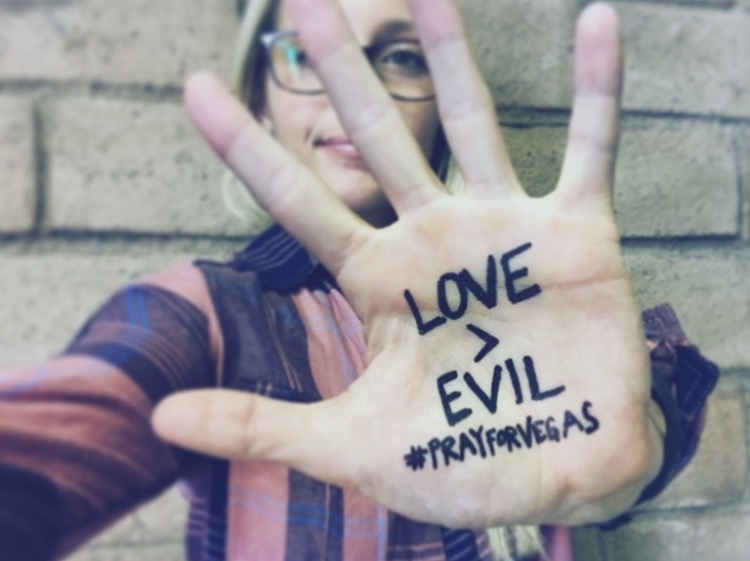 October 1st, 2017 started out as a normal day in Las Vegas and ended in trauma, chaos, hurt, fear, confusion, hate, and evil. It ended by being the deadliest mass shooting in modern day US history. With 59 dead and over 500 injured you could say those of our city, our nation, and others in this world are grieving something we thought was unimaginable. I luckily was not attending the concert where the shooting began. I was home safe. However, I was at the strip just an hour and a half before this occurred supporting our hockey team so my sense of gratefulness that we left when we did is an understatement. My old roommate, a good good friend was in attendance along with many others I love and know. This old roommate of my mine called me in a panic as she sprinted away from the concert to come pick her up telling me that there had been a shooting at the festival. I wasn't sure what to do, how to feel, or how bad this shooting actually was. But this panic in her voice was like no other. It's a phone call you don't want to get. A drive you don't want to take. Luckily she is safe and sound and we made it back to the house with no issues. My heart hurts for those who were there, that witnessed what they witnessed. To feel how they felt. To have a memory they won't ever be able to shake. But y'all are heroes, you're warriors. I admire you. I am here for you. My heart goes out to you all. I believe that traumatic events have the opportunity in creating monumental moments and in turn can create a burning passion deep in our souls. Passion is running wild in Las Vegas right now. We are not able to make sense of what this world has to offer us at times. No one can justify the card that we were dealt. No one has answers that so many desperately want. My heart goes out to everyone affected by this horrifying act of evil. We are numb, we are sad, and we are slightly broken but we are Vegas and we are Vegas Strong. Together we come as a family and together we continue to rise to show the purest form of selflessness. I am blessed to be safe but even more blessed to call this city my home for the past five years and to witness the great kindness that has emerged. This city is exceeding any expectation of what a community is, what a family is, what you do for the ones you love. Community boundaries have been broken, family has become everyone - biological or not, and the ones you love has grown to anyone you can possibly give a helping hand to. People's hearts are bursting with gratitude, love, and kindness and that is the most beautiful site to see. We can not live in fear we can only live. Live life to the fullest and to the absolute max. Live each day with more love, more fight, more courage. Live each day with more kindness and less hate, evil and greed. When the power of love overcomes the love of power, the world will become a better place. Loving in a time of hate is a rebellious act and it is revolutionary. Las vegas is proudly showcasing the power of love. We are rebelling against the hate and the evil. We are united and we are strong.